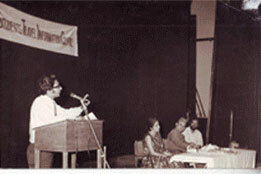 Mr. Subhash Goyal, Chairman addressing the gathering on 14th September, 1973. Born in Delhi, Subhash Goyal did his B.Com (Hon.) and is the recipient of the highest honour of Shri Ram College of Commerce (the Hora Gold Medal). He displayed leadership qualities from the very beginning and was elected President of the Delhi University Students' Union (DUSU) in the Second year of College, becoming the youngest-ever DUSU President (1966-67). An M.B.A. from Delhi University, Subhash Goyal went on to become the President of the All India Central Board of University Students' Union (1967-70), a body representing over 9 million students. He received his PhD Doctorate Degree in Business studies from the Intercultural open University, Netherlands. Subhash Goyal is the founder Chairman of STIC Travel Group of Companies, which he started in 1973 as a small travel and information center for students and built it up as one of the largest travel businesses in India, with 40 offices having over 300 professionally trained employees, representing various International Airlines and other tourism related products and services. An ardent advocate of liberal aviation and tourism policies, Subhash Goyal is constantly trying to persuade the government to allow more International Airlines to start flying to India. He was unanimously elected as the President of the Indian Association of Tour Operators for 6 years in a row (1995-2000). He has also been an honorary member of various Government bodies including the Tourism Board of Government of India, U.P. Tourism Board, Haryana Tourism Board, Government Institute of Tourism and Travel Management Gwalior, Airport Authority of India, Hotel classification committee, Treasurer - PATA India Chapter, Editor IATO News and a Member of the Tourism Committee of the Planning Commission. Mr. Goyal is also the Recipient of Gem of India Award, Udyog Gaurav Award, Award for Excellence, Award for promoting National integration and contribution to the tourism industry of India, Order of Merit, he has also received several honors and awards from the Airlines he represents. He is also the recipient of the International man of the millennium Award from International Biographical Centre, Cambridge, Indira Gandhi Millennium Award 2000 and the 5000 personalities of the World award from the American Biographical Institute. He has been an advisor to various national and international organisations and a columnist with the Hindustan Times on Tourism and Civil Aviation. He has been regularly contributing articles in various trade magazines and newspapers for the development and promotion of tourism in India and South Asia. Received Outstanding Task Force Leader Award 2001. Recipient of Rashriya Ratna Award from United Indians at a glittering function in 2001. Award for promoting national integration and contribution to the Tourism Industry of India. Order of Merit 1994. Indira Gandhi Millennium Award 2000 and the 5000 personalities of the World award from the American Biographical Institute. Also received several honors and awards from the Airlines represented.